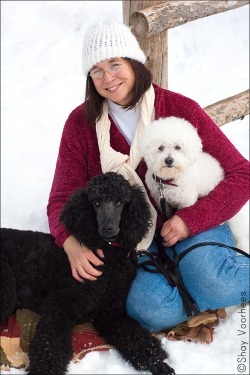 Stacy currently shares her home with two therapy dogs, Cosita and Liberty. They have been registered Delta Society Pet Partners since 2002 as members of Therapy Animals of Utah. Stacy, Cosita and Liberty have visited teenage clients in a lockdown facility, elderly clients who live in various care centers, adults in a drug rehab center, terminally ill clients in hospice, and children in a childrens' hospital. She is a Delta Society instructor and evaluator and helped design the Delta Society 8 hour Pet Partner Course. Stacy has a Bachelor's degree in Elementary Education, a Master's degree in Deaf Education, and graduate certificates in English as a Second Language and Animals and Human Health. Besides volunteering, she spends her weekdays as a fourth grade teacher. In her free time, she's usually found hiking or camping with Cosita and Liberty.